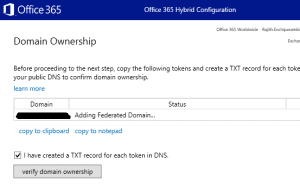 How to go past the 'Adding Federated Domain' status in the hybrid configuration wizard, while running from an Exchange 2016 CU7 server? I have come across this issue a couple of times now and mostly while the server from which I am running the hybrid configuration wizard is Exchange 2016 CU7. This is not to say that it won't happen on another CU level. The issue is that HCW gets 'stuck' while trying to verify the domain's TXT record (to prove the ownership) and adding the domain. The wizard verifies the existence of the TXT record, but doesn't go past the window below even after letting it do it's thing for hours! A quick google confirms that there are number of other customers who have the same issue and number of workaround and solutions have been suggested. The one solution that has worked for me all the time is to have an ini file in the 'Config' folder of the Exchange 2016 server. Follow the exact steps below. Open Notepad, copy & paste the text below. Make sure that the file type is set to txt while saving. It won't work otherwise. Place this file in 'C:\Program Files\Microsoft\Exchange Server\V15\Config', assuming that Exchange 2016 is installed on the C drive. 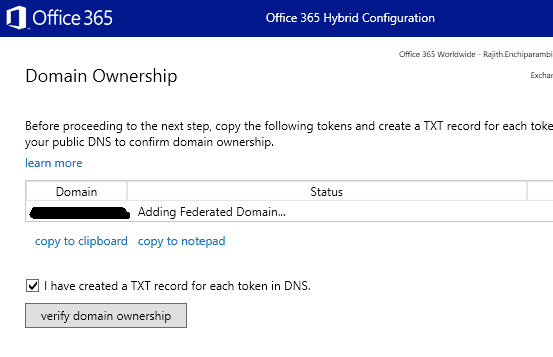 Run the HCW again from scratch and it should go past the 'Adding federated domain' status. Have you used any other workarounds for the same issue? Let me know in the comments below. That worked like a charm! I love you man will you marry me? Glad it worked for you Sean. Did yo get it resolved Renier? Waiting for a bit before trying again might help.